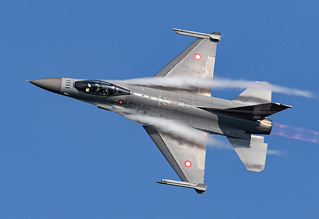 NATO Days in Ostrava is one of the largest 'free to enter' airshows in Europe, with a typical visitor attendance each day in excess of 100,000. This year also marks the 100th anniversary of the Czech Air Force, so like RIAT with the RAF, and Radom with the Polish Air Force, this was the Czechs' opportunity to celebrate their centenary anniversary with their home crowd. With both the RAF and Polish Air Force's respective celebrations failing to hit the heights expected, this was a chance for the Czech Air Force to eclipse both of their centennial celebrations. Nick Jennings reports from NATO Days in Ostrava for UK Airshow Review. Photography by the author, with contributions from Howard Barrett and Steven Harrison-Green. The event has the long-winded official title of 'NATO Days in Ostrava & Czech Air Force Days', but is normally known just as NATO Days. The show is now in its eighteenth year, having started in 2001 as a small show demonstrating regional armed forces, police, and rescuers. With the move to the Leoš Janáček Airport in 2003, an air component was added, increasing its appeal to a wider demographic of military enthusiast. 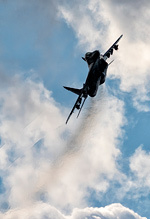 Czech Air Force Days was then rolled into the, by then, well established NATO Days show in 2009, and it is now the largest military show in Central Europe. Formerly known as the Ostrava-Mošnov International Airport, in 2006 the current venue was renamed the Leoš Janáček Airport after the famous Czech composer. It's a somewhat strange location for an airshow of this size, as it's still a fully functioning international airport, with civilian flights arriving during gaps in the show. Add to this the display line that runs perpendicular to the axis of the runway - for no apparent reason - and you have quite an unusual setup for an airshow of this type. With the east-west runway and north-south display line, the crowd are confined to the north-east corner of the airfield, this also unfortunately means that if you are interested in photography you will be facing into the sun for most of the day. Having said that, people are free to leave the showground area and walk around to the fields in the northwest corner - making sure to avoid the taped off areas - and take their photos from there. Like many other European air forces, the origins of the Czech Air Force can be traced back to the close in hostilities of World War I. Formed in October 1918 as the Czechoslovak Aviation Corps, the fledgling air force operated a variety of indigenous aircraft types in the early years, from the likes of Aero, Avia, Letov, and Zlin. The Czech Air Force of today came into existence in 1993, following the breakup of Czechoslovakia, and the Czechoslovak Air Force - this of course means that they also share their anniversary with the Slovak Air Force. 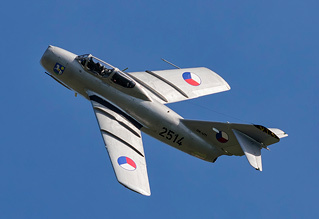 The Czech Air Force currently operates a variety of types, ranging from former Soviet Bloc aircraft through to modern western types, almost all of which were on display either in the air or on the ground. When the USA was announced as this year's 'Special Partner Nation' hopes were obviously high that there would be a large USAF contingent present. Strangely though, in the months leading up to the show there seemed to be very little interest among the UK airshow attending community in this event, with much more interest in the Radom show. 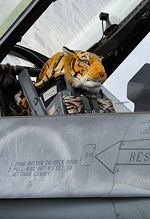 Whether this was down to the very western line-up of aircraft featuring in the display, or the very late announcement of the USAF participation, it's unclear. From the USA, the Army were the first to announce their participation, with a pair of AH-64 Apaches - "Odin" and "Hela", an M1 Abrams MBT, and an M2 Bradley IFV. 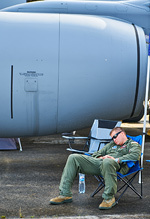 The wait then began for the much anticipated USAF announcement. When this finally came a week before the show, it was met with massive disappointment on the organiser's social media page. With nothing in the flying display, and a similar quantity in the static display to previous years, people were quite rightly questioning why the US was down as the special partner nation, and the late - although welcome - announcement of a US Marine Corps UH-1Y Venom did little to dampen the disappointment. Unfortunately, as often happens, there were a number of cancellations prior to the show, most notably the Dutch KDC-10, and the inclement weather for Friday's arrivals certainly didn't help matters, with the P-3s and German Typhoon dropping off the arrivals list. Fortunately, the Swedish AF Historic Flight did manage to brave the conditions, albeit arriving later than their advertised slot after conditions had improved somewhat. Rehearsals were also - understandably - severely impacted, with only rotary aircraft able to rehearse within the confines of the low cloudbase. The solitary car park opened at 6.30am on both show days, but with the roads around the airport acting as a funnel, traffic is usually very heavy, frequently with delays of several hours or more getting onsite. Getting there as early as possible is definitely a wise move if travelling by car, although with the gates to the showground not opening until two hours later, it does mean there is a lot of waiting around once you have parked up. The main showground is well laid out, with the aircraft and vehicles all within their own designated areas. There's also a central arena where the ground action takes place. It is worth noting that most of the toilet facilities do have a charge to use them, though this was only 10 crowns - equivalent to about 30p. What is surprising compared to typical UK airshows, is the sheer number of food vendors at the show, with many serving traditional Czech fast food, as well as western alternatives. It must be mentioned that with NATO Days being an air and ground show, there are noticeable delays between some of the aerial acts whilst ground demonstrations are taking place. Some of these gaps can last up to 25 minutes, somewhat breaking the flow of the show if you're not in the vicinity of the main arena. Although if you're smart about it, these breaks can be utilised for food or toilet stops, or just putting the camera down and taking a breather. As is frequently the case with shows in mainland Europe, the organisers managed to attract some real gems for the static display, including shorter range types not often seen in the UK. The Lithuanians sent a number of items for the static, with the highlight being the SAR variant of the AS.365 Dauphin. 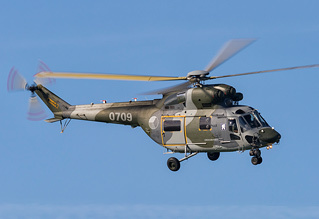 The Germans also sent rotary assets, including an EC135 from the German Army Aviation Corps, and a Bell 206 from Motorflug, which is used in the basic helicopter training role. Two special scheme Austrian PC-7 training aircraft also attended, as did the stunning Belgian Hercules - CH-10 - which celebrates the 75th anniversary of 15 Wing, and 45 years operating the C-130H. With this year also marking the Slovak Air Force's 100th anniversary, it came as no surprise that they also sent a number of items for the static park, including a MiG-29UB 'Fulcrum' trainer, and a UH-60 Blackhawk. Of course the Czechs were not to be outdone at their own show, and had on display a variety of assets, both rotary and fixed wing, although somewhat surprisingly, no Gripen. A number of items were displayed on a hardstanding in a nice wooded area, ideal for photography, however small marquees erected by the crews made photography harder than it could have been, and the US assets were almost impossible to photograph cleanly, due to public and crew milling around the aircraft for most of the day. The action kicked off almost as soon as the gates opened, making viewing the static and seeing the displays a tricky proposition, with some sacrifice inevitable. With eight frontline fighter jets in the programme - five of which used flares, and almost all of which wore special markings - fast jet photographers were in for a real treat, with the aircraft contrasting nicely against the clear blue sky on the Sunday. 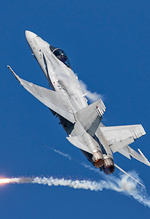 The award for most flares used has to go to the Finnish pilot Cpt Lauri Mäkinen, whose F/A-18 Hornet deployed flares at almost every opportunity! 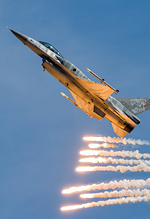 The Polish F-16 wasn't far behind, with a jaw-dropping machine gun style flare drop following a high alpha pass. If you like flares then you certainly can't go wrong with the NATO Days show. Probably the most dynamic displays of the day were the French Rafale, and the RAF Typhoon, it's just such a shame that the RAF missed a real opportunity to create a truly memorable design for their 100th anniversary, instead of opting for the corporate RAF 100 logo that they chose in the end. It really didn't match the dynamism of the RAF Typhoon display - which was flown brilliantly by Flt Lt Jim Peterson - and although the splash of red is welcome on such a plain aircraft, the Spanish Typhoon tiger design just looked so much better. 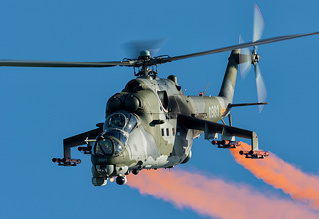 Along with the fast jet displays, a number of rotary assets were also demonstrated; including the venerable Mi-24/35 'Hind', along with Mi-171 'Hips', and W-3 Sokols. LOM Praha's Flight Training Centre sent over a vintage Mi-2 'Hoplite' and a more modern Enstrom 480B-G. Many of these helicopters are rarely seen on UK shores, so it was a great opportunity to be able to see them display. There were also a number of flypasts; with the main flypast celebrating the Czech Air Force's 100th anniversary, with types from the Spitfire and MiG-15, through to the Airbus A319 and Gripen. This flypast was poignantly concluded with a poppy drop by Tony De Bruyn, in his specially equipped OV-10 Bronco, commemorating the lives of all those lost in war. The Slovaks also carried out a couple of flypasts; one of which consisted of an extremely low flypast of the Government's Airbus A319 and Fokker 100 aircraft, and later on a series of flypasts by a pair of MiG-29 'Fulcrums'. 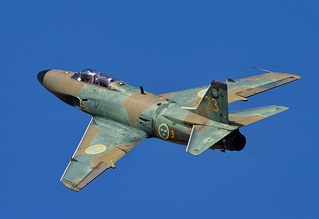 Of course the stars of the show in many people's eyes were always going to be the Swedish Air Force Historic Flight, and they certainly didn't disappoint. The SwAFHF are one of the most requested foreign acts within the UK, and it's not hard to see why, with their iconic delta wing aircraft resembling spaceships. Having been fairly regular attendees of NATO Days since 2013, this year they brought with them a Saab Lansen, Draken, and Viggen, the last two being notable as aircraft that have yet to display at NATO Days, having both been only returned back to flight within the last 18 months. First to display was the Lansen, designed in the 50s for the fighter and ground attack roles, it was still serving up until the late 90s with the Swedish Air Force, as with most planes of that era it was a fairly sedate display with no high energy manoeuvres. The gloss grey single seat Draken was up next, roaring into the sky with full afterburner. The Draken looks like it could have been designed recently, rather than back in the 50s, with its unusual cranked delta wing - only the small cockpit canopy and nose radome give away its true heritage. Following on from the Draken, the Viggen took to the air, but after a bit of a hiccup with the Viggen display on the Saturday, no-one was quite sure if it would perform a full display on the Sunday. Fears were soon allayed as spectators were treated to the sights and booming sound of the splinter camo'd twin stick Viggen in full afterburner, this really was something truly special for the aviation enthusiast, and a real highlight of the show. Continuing the Saab theme, the tiger scheme Czech Gripen was next up, flown with style by Cpt Ivo Kardoš - who also picked up the Ostrava Mayor Award for the best dynamic display - it was a display full of colour and flares, and a fitting end to the 'Saab' section of the flying programme. The show finale again featured the Swedish AF Historic Flight, this time altogether in a big vee Nordic flypast, along with the Finnish Hornet and Danish F-16. As they came into land following their display, the golden light along with the hills in the background provided a spectacular sight, and the perfect conclusion to a great show. Hats must go off to the Czech Republic for offering such a great show at zero entry cost to the visitor. An undertaking of this magnitude requires significant resources, both financially and logistically, and they should rightly be proud of the spectacle that they created for their Air Force's centenary anniversary. This show was surely one of 2018's airshow highlights, and hopefully NATO Days 2019 will equal or surpass this year's effort, although that may be a tall order! Next year's show is due to take place over the weekend of the 21st-22nd September.